I love an easy project and this one was created out of necessity since all the pjs Anja got for Christmas were too big for her to wear now. This flannel peasant-style nightshirt features raglan sleeves and a drawstring tie back in my current colour crush of grey and yellow. 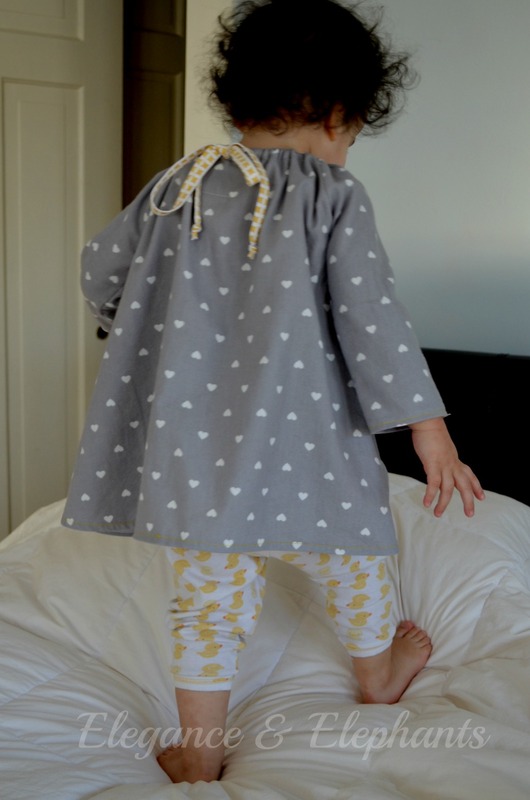 I made it a nightshirt, but of course, it's easy to lengthen into a nightgown or maybe even add a pretty ruffle at the bottom. Cut two of front & back on the fold. Cut two sleeves on the fold. Cut a little piece of contrasting fabric for the back tie openings. Sew the sleeves to the front and back. Sew the little back piece to the centre of the back and sew in a squared off U-shape. Cut down the middle being careful not to snip any stitches. Iron the edges of the contrasting fabric, then finish/serge the neck edge. Turn to the wrong side and stitch the edges of the contrasting piece, adding a tag if you have one. Fold over neck edge and stitch. *this photo was taken after I'd already added the ties...oops! Add bias tape or ribbon ties. I made my own...here's a tutorial. 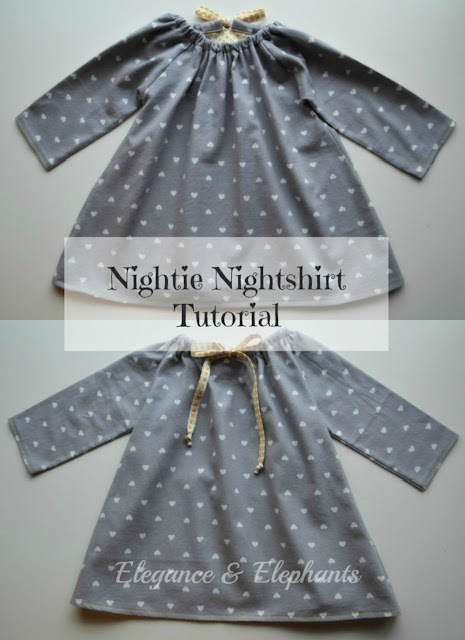 13 comments on "Nightie Nightshirt Tutorial"
SO precious! Love that pic of her sleeping! So adorable! I bet it's so soft too. Cute! Aww, cute! 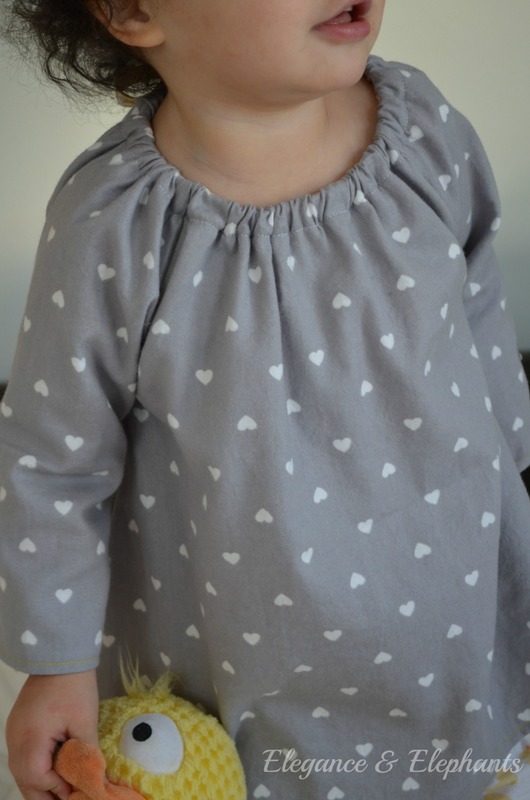 I made something similar to this when my oldest was 1, but I used elastic in the neckline instead of a drawstring. that is such sweet fabric - and I like the little pop of yellow in the facings and ties! This is so cute! And the flannel is adorable. Definitely pinning it! I don't ever think about making flannel pj tops for my kids because the buttons, piping, collars, etc. scare me a little. But making the pajama tops in an easy peasant style but still out of flannel...I've never thought of doing this before. Thanks so much for the inspiration! Happy New Year!